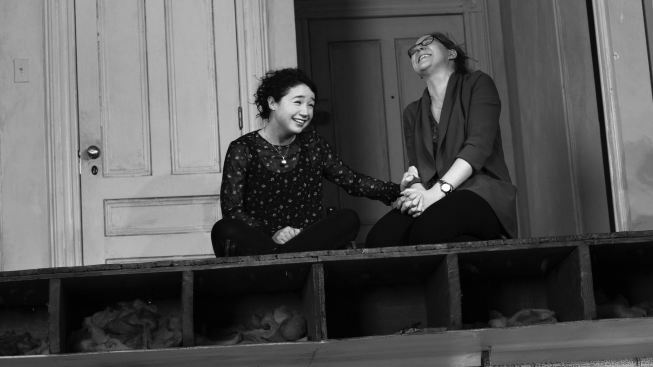 Stephen Karam Makes His Move to Broadway with "The Humans"
Sarah Steele and Cassie Beck, as sisters in "The Humans." Below, Steele and Reed Birney take "The Humans" to an entirely different level. Our calendars are teasing spring, but it's still Thanksgiving in the Chinatown duplex Brigid Blake shares with boyfriend Richard in “The Humans,” Stephen Karam’s eloquent and wholly relatable modern family drama. “The Humans” made such a ruckus Off-Broadway last fall that it caught the attention of producer Scott Rudin, who blessedly seized the whole thing—cast, director Joe Mantello, ramshackle set and all—and bumped it across town to Broadway’s Helen Hayes Theatre, where it’s just opened. Time has made the members of the Blake family seem more vulnerable, and at the same time brought to each a heightened awareness of what’s meaningful in their lives. All six characters are either suffering, recovering from or succumbing to some devastation, of varying scale. Brigid (a pointedly droll Sarah Steele) is dutifully setting up her new home—with its perpetually popping lightbulbs and a lead-footed upstairs neighbor—while quietly coming to terms with the fading dream of a music career. On a snowy holiday, parents Deirdre and Erik (Jayne Houdyshell and Reed Birney) drive in from Scranton. Brigid’s sister, Aimee (Cassie Beck), suffering from ulcerative colitis, in the throes of a breakup and on the verge of unemployment, has taken the train up from Philadelphia, a city so boring “not even terrorists” want to be there. Deirdre and Erik have brought along his ailing mother, “Momo” (the fabulous Lauren Klein), confined to a wheelchair and in the perhaps final year of gripping dementia. Richard (Arian Moayed, of “Bengal Tiger…”), recovering from depression, is on hand, largely to keep Brigid steady amid the influx of family. Sensitively staged by Joe Mantello, “The Humans” transpires in real-time, as one uninterrupted 95-minute act. The two-tiered set has a bathroom on the second floor and kitchen on the first; characters travel between the two via a spiral staircase … except for wheelchair-bound Momo, who must be pushed into the public hallway and brought upstairs in an elevator. “No New Yorkers have duplex apartments,” says a prideful Brigid, by way of explanation to her confounded parents, who have arrived with a care package that includes all the things one might need to survive a flood, or worse … including a statue of the Virgin Mary. Dad (affectionately called “Big Guy” by his daughters) isn’t high on New York City. He sees it as the place his dying mother worked to escape; also, he was last here to bring Aimee for a job interview on 9/11. Part of his agenda this fraught evening is to bring the girls up-to-speed on recent issues in his marriage to their mother. Houdyshell’s Deirdre is sarcastic, maternal and wounded, but if a single trait rises to the surface it’s how stoic this woman is. For 40 years she’s worked in the same low-paying suburban job, watching as kids in their 20s catapult over her. But Deirdre finds her satisfaction where she can. At the moment, it happens to be volunteering with members of Scranton’s Bhutanese refugee population (peacemaker Richard, at least, encourages her to talk about it). Jarring noises factor profoundly in the drama. Aside from the mysterious neighbor, there’s a groaning trash compactor. Pots and pans crash to the floor. Karam paints such a dynamic portrait of real life that I could only sit and absorb the insecurities and frailties batted around on stage. “The Humans” is monumentally affecting, and something for which theatergoers should be oh-so-very thankful. “The Humans,” with an open-ended run at the Helen Hayes Theatre, 240 W. 44th St. Tickets: $39-$125. Call 212-239-6200.